This race has been cancelled due to warm temperatures and rain. We will be offering the following classes: One & two-dog skijor ($35), 4-dog ($35), 6-dog ($35), 8-dog ($40), unlimited ($40), and three-dog junior ($10). Distances: 11 miles for the unlimited and 8-dog classes; 7 miles for 6-dog and skijor classes; 3 miles for 4-dog and 3-dog junior classes. Class order: 1-dog skijor, 2-dog skijor, 4-dog, 3-dog junior, 6-dog, unlimited, 8-dog. Trail: The course will be an out-and-back course with head-on passing. The course is on a rail trail and is fairly flat and straight. The turnaround for the six-dog sled class and the two-dog skijor will be different this year. Driver’s meeting: We will have a driver’s meeting at 8:30 am and the first class will go out at 9:15 am (these times are subject to change). The purse is $2000. The race is ISDRA sanctioned. The start/finish will be at 10 Railroad Street. Competitors may park at the Oxbow Riverfront Park at 257 Portland Street, Morrisville, Vermont. Our 2018 dryland race will be held November 10th and 11th in Auburn, New Hampshire. There are two changes to note for this year. First, because of logging all classes will run on the 3 mile trail. 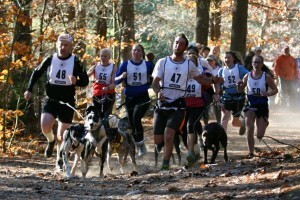 Second, canicross will be held on Sunday only. Race fees are as follows: $40 for 8-dog rig (ISDRA fee included); $35 for 4- and 6-dog rig, 1- and 2-dog bike and scooter (ISDRA fee included); $25 for canicross (ISDRA fee included); $10 for 3-dog junior. Check in for the race will begin at 8 am. Please drop off forms and fees and pick up bibs at this time. There will be NO onsite registration for the race. There will be a mandatory drivers’ meeting at 8:30 am. The first class is slated to start at 9am. This schedule is subject to adjustment. On Sunday, canicross will go out before the 8-dog class so this will push events back by approximately one hour. Breakfast and lunch will be offered for donations—all profits going to Liberty House, a home for veterans in need. Racers and spectators are encouraged to bring sleeping bags, sneakers, backpacks, and non-perishable food items for donation to Liberty House. The race is held at the Manchester Water Works in Auburn, New Hampshire. We are the guests of the Manchester Waterworks, please be courteous and respectful of the property and rules. Keep the area around your truck clean and be sure to pick up after your dogs and yourself. Auburn is quite close to both Manchester and Concord, which have ample hotel and dining options. Take Rt. 101, Exit 2. Go 7/10 mile towards Auburn. Look for 35-mph sign on right. Go slow as you go up small hill. Just after crest of hill, turn left onto Depot Rd. Go 3/10 mile to field. Drive through yellow gate on right. Please park in neat rows in the field, not too close to the trail head or on dirt roads. We will be offering the following classes: One & two-dog skijor ($35), 4-dog (pro: $35, sportsman: $25), 6-dog (pro: $35, sportsman: $25), 8-dog ($40 pro), three-dog junior ($10), one-dog junior ($5), recreational ($5, Saturday only). Competitors registering as “sportsman” will receive no ISDRA points and not have a stake in the purse. Distances: 6.6 miles for the 6- and 8-dog classes and 3.3 miles for the 4-dog, 3-dog, and skijor classes. The venue for the race is the very welcoming Sunset Ridge Golf Course. There will be hot and cold food available in the warm clubhouse. We urge all sled dog teams and participants to patronize downtown Westbrook businesses which are on the route between the hotels and the golf course. Registration for the rescheduled date will open on February 1. Take the Westbrook/Portland Exit 48 off of the Maine Turnpike. We will be offering the following classes: One & two-dog skijor ($35), 4-dog (pro: $35, sportsman: $25), 6-dog (pro: $35, sportsman: $25), 8-dog ($40 pro), unlimited ($40 pro), and three-dog junior ($10). 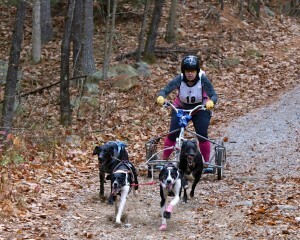 Distances: 11 miles for the unlimited and 8-dog class; 6 miles for 6-dog and skijor; 4 miles for 4-dog and 3-dog junior. The course will be an out-and-back course with head-on passing. The course is on a rail trail and is fairly flat and straight. We will be having a drivers’ meeting Friday night at 6:30 pm at the Charlmont Restaurant, Rte. 15, Morrisville, at which time we will draw bibs. The purse will be at least $2500. The race is ISDRA sanctioned. On site registration will take place at the drivers’ meeting on Friday, Jan. 19. There will be no day-off registration. Our 2017 dryland race will be held November 11th and 12th in Auburn, New Hampshire. Registration is now closed. Recreational run for 1-4 dogs (1 mile). Race fees are as follows: $40 for 8-dog rig (ISDRA fee included); $35 for 4- and 6-dog rig, 1- and 2-dog bike and scooter, and canicross (ISDRA fee included); $10 for 3-dog junior., $5 for recreational. Check in for the race will begin at 8 am. Please drop off forms and fees and pick up bibs at this time. There will be NO onsite registration for the race. There will be a mandatory drivers' meeting at 8:30 am. The first class is slated to start at 9am.